When the MOTU Classics line first began to pick up steam, Noisy and I started going through the more obscure MOTU characters to see who might get made. We ran across Procrustus early on, but didn’t have high hopes that this four armed giant would ever get made. Now that his figure is in-hand, and mingling with the other characters on my shelf, I can definitely say that I’m glad Mattel proved us wrong. Procrustus is just another great example of how the Four Horsemen can really bring a character to life. He only appeared in two pages of one mini-comic, yet the 4H took his basic design and added more detail than ever appeared on those pages. Most obvious of which are his rocky details. The mini-comic gave an impression that Procrustus was made of stone, but there’s definitely no question when you look at the figure. His upper body is pebbled and fractured, while his clothing and hair look like cascading slabs. 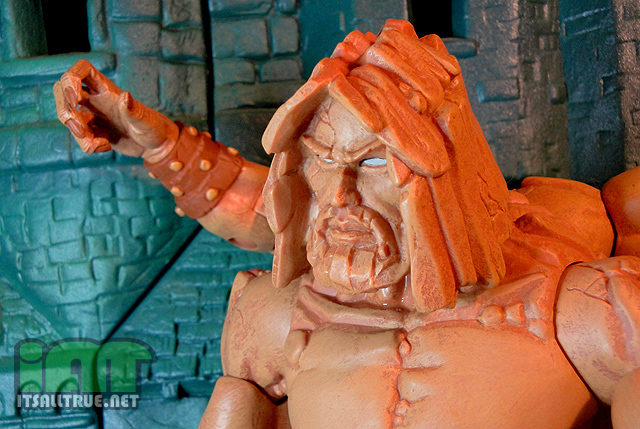 All these sculpted details look fantastic and really give the character a Harryhausen-esque feel that I definitely welcome in the MOTU-verse. Procrustus has a very basic paint scheme, and I really found him a bit difficult to photograph. 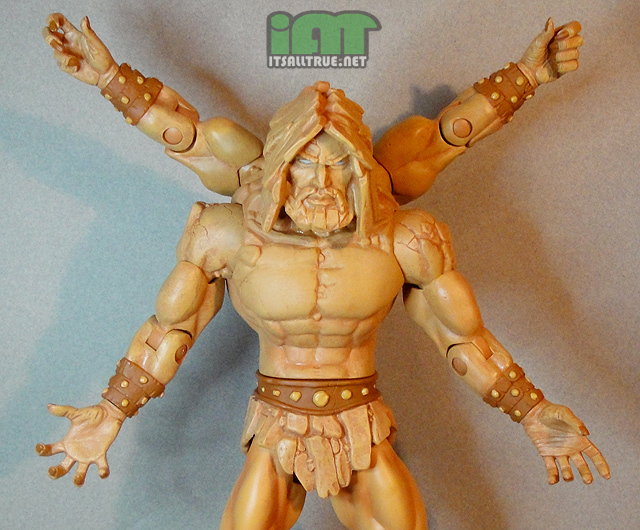 The figure itself is made up of a light tan plastic with a darker brown to accent his belt and bracers. The muscles of his legs and joints between rock pieces were also given a darker tan spray. But it’s the pale brown dry brushing that really gives him that living stone look. This is also the effect I had a hard time capturing in my pictures. But I can attest that the figure’s color really pops in person. That last pic is hilarious because Me-TV just ran “The Search” the other morning and I was thinking how messed up it was. Zodac nearly made He-Man turn big time evil and join up with Skeletor for all of a sec there just Zod could “test” him. That is whacked. As for Procrustus, I didn’t know this dude from Adam (no pun intended) before the first pics showed up online but he looks killer. Excellent paint jobs and sculpting all around on the 4H’s part. You took some great photos there, Vault. The one where Pros is holding the Star Seed is awesome! Agreed on Zodac’s “test.” If He-Man had turned evil, gained utimate power and the ability to change reality just by wishing it, what could Zodac have done to stop him? Did not think it through. Indeed, the Harryhausenesque stuff will get me every time, and Pro’ here is no exception. I just wish the legs matched the rest of his body better. The last shot of Pros reminds me of an Album cover. Honestly thinking finding a guitar in scale to him hold and do that pose. All around I haven’t bought a giant do to space issues. May look into getting now but store away. Great review and pics, and love the last panel! Still thinking of repainting definitely his fax (an Old English word that collectively means “the hair on the head”), and possibly his trunks, in a light green colour scheme to better match the source material. One question, though: do his eyes actually glow int he dark, or are they just cunningly painted to appear that way? The best giant that we have in Classics so far. 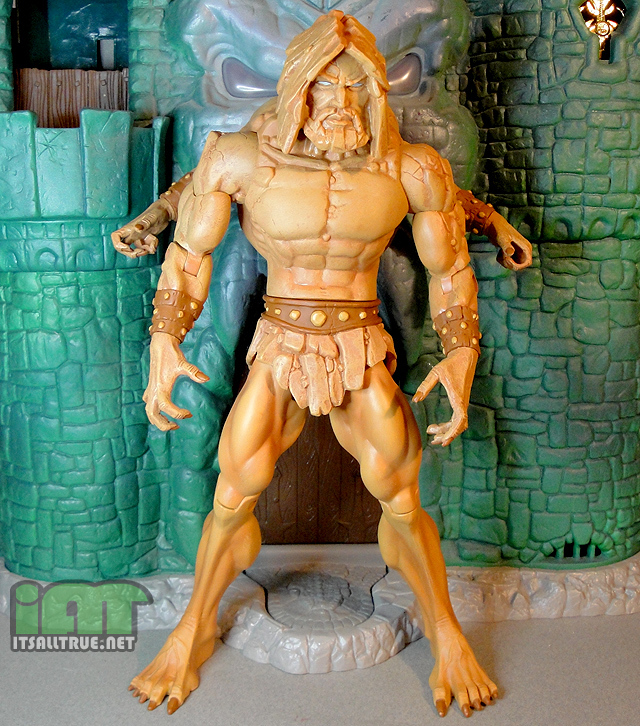 I love the giants because, frankly, their aesthetic is much more in line with 200X MOTU than MOTUC. 200X is my preferred line. I think this guy is a big misfire. Very bland. Much nicer looking in the comics. I’m with you there. I wouldn’t have lost any sleep if this guy was never made. A little off topic what happened to Ram man this month? Not all the units arrived in time, so he was delayed until next month. 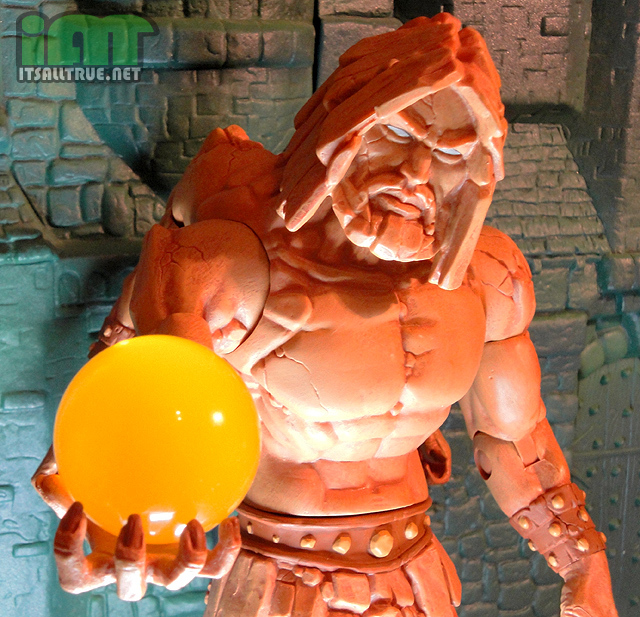 He looks okay for a character who all but defines “unknown” that only the die hard MOTU fan would “need”. I do agree that he would fit in perfect with some sort of Harryhausen display, as he definitely gives off that vibe. Kudos to the 4H for that. Procrustus is the only giant I’ve thought was worth purchasing. Not having a sub I went out of my way to get him. I’ve had him fighting Hordac, Vegeta, half the Justice League, and just about any other toy that I thought was interesting. He is definitely one of my favorites from 2012. He-Man is great but I have way more fun with the oddballs like Gy-Gor, Lazerlot, and Crusty here. For some reason I would love to see some photoshopped versions of him in different rock colors like dark gray and what not. Love this figure! Mine arrived today. After warming him & Granamyr up a bit in front of the fire, I had no problems attaching his arms. Unfortunately, the bottom of his torso came out of the package curled up a bit at the edge, so it looks cheaply made. Also, Granamyr’s right arm socket was knackered right out of the box and his right knee doesn’t bend as much as it should. That, along with Mosquitor’s Gummi hands, made this one of the most anti-climactic shipments I’ve ever received, on three of the characters I was most looking forward to. Bleah.